Earlier today MLB officially announced the 2019 regular season schedule. Usually the schedule doesn’t drop until mid-September. MLB got it out of the way early this year. The Yankees open the season on Thursday, March 28th, at home against the Orioles. March 28th in the Bronx? Looking forward to the home opener getting snowed out for the third time in four years. 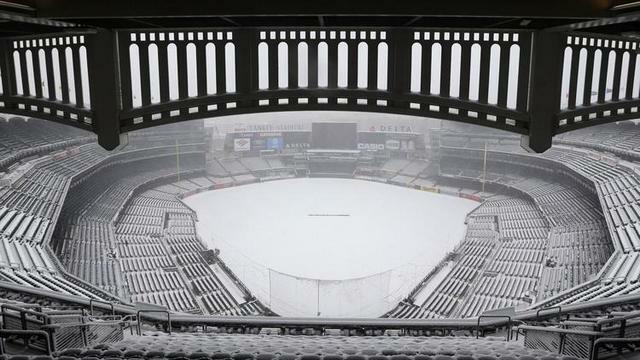 Anyway, the Yankees open the season with a three-game set against the Orioles — as usual, there is an off-day after Opening Day in case they get snowed out — before welcoming the Tigers to the Bronx for the three-game series. The first road trip follows after that and takes the Yankees to Baltimore and Houston. The Yankees and Orioles will be at each other’s home openers. Fun. Here is the full 2019 schedule and here are the highlights. As part of MLB’s initiative to grow the game globally, the Yankees and Red Sox will play a two-game series in London on June 29th and 30th. It’s a Saturday and Sunday. Both the Yankees and Red Sox will have two off-days prior to the series and one off-day following the series. I imagine there are events planned for that Friday. The Yankees have a ten-game homestand, then two off-days, two games in London, one off-day, then they return to New York for a road series against the Mets. I should note the Red Sox will be the home team for the two London games — the Steinbrenners weren’t going to give up two lucrative home dates — and, because of that, the Yankees only make two trips to Fenway Park next season. Two four-game series: Thursday, July 25th to Sunday, July 28th and Friday, September 6th to Monday, September 9th. First trip to Boston is in late July? Weird. The Yankees go to Arizona, Los Angeles, and San Francisco. The Padres and Rockies come to New York. Too bad the Yankees are not going to Coors Field. Aaron Judge and Giancarlo Stanton in the thin mountain air? Goodness. Once again, the Subway Series will be a set of two two-game series. Bummer. I greatly prefer three-game series with a definitive winner. There are a lot of Mets fans in my family and bragging rights are fun. The Mets come to the Bronx on June 10th and 11th (Monday and Tuesday) and the Yankees go to Queens on July 2nd and 3rd (Tuesday and Wednesday), immediately following the London trip. I was worried the Yankees would get stuck with three West Coast trips because of the NL West interleague play thing, but thankfully that is not the case. They have two long West Coast trips instead. Four games in Anaheim? What could possibly go wrong? I also like the travel for the second West Coast trip. Start in Oakland, then fly down to Los Angeles, then fly up to Seattle. Couldn’t go Los Angeles-Oakland-Seattle or Seattle-Oakland-Los Angeles? I guess that would’ve made too much sense. The Yankees close out the 2019 regular season on the road and that last week is kinda weird. They have an off-day Monday, September 23rd, then play two games in Tampa. They have another off-day Thursday, August 26th, then they close out the regular season with three games in … Texas? Texas. Only seven of the final 17 regular season games next year will be played against AL East teams. The Yankees see the Tigers, Angels, and Rangers within the last three weeks next season. No big series in Boston to close out the season or anything like that.